On 30 April 1988, one of the most remarkable El Clásico encounters to ever take place unfolded at the Camp Nou between Barcelona and Real Madrid. The game came just two days after a significant number of the Barcelona squad had stood at a press conference in the Hotel Heredia to call on the club president Josep Lluís Núñez to resign. A tax row had erupted that engulfed the club, and the Spanish government was taking a very hands-on approach to the situation. It had come to light that some members of the Barcelona squad had signed two contracts with the club, one of which was declared to the tax authorities and one that wasn’t, thus reducing the amount of tax being paid. When the authorities came calling at Camp Nou to collect the sums of tax money that had been evaded, a stand-off occurred; Núñez insisted it was the players rather than the club that needed to put their hands in their pockets. The players disagreed with their president, arguing that the club had guided them to sign the double contracts and that they were instead responsible for the losses. When El Clásico night came around the Barcelona fans had a defined choice to make. Back the players or back the president. While there was no all-encompassing devotion from the fans for Núñez, with many of them indeed wanting him out, the concept that he represented Barcelona against a set of players who were attacking the club was the winning card. Barcelona’s players were unprecedentedly booed and whistled onto the Camp Nou pitch for a Clásico, while the Real Madrid side that had just clinched the La Liga title and had even been afforded a guard of honour by the Barcelona players, were surreally applauded into the usual bear-pit of an arena for the club that wears white. One of the main protagonists in the tax evasion saga was Bernd Schuster. A personal legal wrangle with the club that ended up in the law courts was the first domino to fall. Schuster was in the Barcelona side that day in what would be his last Clásico in a Barcelona shirt. It wouldn’t be the last time he was booed and whistled at by thousands of Catalans at the Camp Nou during an El Clásico, however. The following season it was a fixture he again took part in; except, this time, it was in a Real Madrid shirt. A decade earlier, an 18-year-old Schuster had risen to prominence in his homeland with some stand-out performances for the West German under-19 side. With an on-field maturity beyond his years and an almost effortless style, Schuster was quickly plucked from the youth team of his hometown club FC Augsburg and signed by the reigning Bundesliga champions, FC Köln. Köln were coached by the legendary Hennes Weisweiler, the man responsible for the inexorable rise of Borussia Mönchengladbach. Weisweiler had left Gladbach in the summer of 1975 just as the club was reaching its peak, taking over from Rinus Michels at Barcelona, only to return to West Germany within a year to take over at Köln for the third time in his career. Schuster’s force of nature was too much to ignore for Weisweiler and he was soon in the starting line-up. Schuster was yet to turn 19 and it was a long-held German developmental pattern that young players were protected and nursed through the ranks to first team football. It was accepted protocol that players didn’t usually make a breakthrough until their early twenties. Schuster was too good to hold back, and he became an integral part of the Köln side from almost the word go. In his debut season, Schuster came desperately close to reaching the European Cup final, his side having shot into a 2-0 lead in the semi-final first leg at the City Ground against Brian Clough’s Nottingham Forest, before the home side launched a fantastic fight back. Köln finally walked away from the East Midlands with a very useful 3-3 draw but contrived to lose the second leg 1-0 and missed out on the Munich final. The following season Schuster broke into the national side. Jupp Derwall had taken over from Helmut Schön after a disappointing 1978 World Cup by exacting German standards and had replaced a number of the ageing players Schoen had taken to Argentina for an injection of youth. West Germany qualified for Euro 1980 without any major scares. Back at Köln, Schuster was frustrated by his club’s second successive title challenge failure, although there was a run all the way to the German Cup final. It would, however, be disappointment once again as Fortuna Düsseldorf came from behind to retain the trophy they’d won twelve months earlier. Euro 1980 proved to be the game-changer for Schuster. He appeared in just two of West Germany’s four games in Italy but excelled in both of those games that made the megaliths of Spain and Italy sit up and take notice. Having been brought into the side to be the puppeteer of the pivotal second group game against the Netherlands, with an elegant style of pushing and prompting that provided Klaus Allofs with an unexpected hat-trick, Schuster sat out the last group game so as to not risk a second yellow card of the tournament that would have kept him out of the final. In the final against Belgium Schuster again pulled the strings, and Horst Hrubesch was this time the goalscoring beneficiary. At the age of 20 Schuster had a European Championship winner’s medal in his possession and what looked to be a long and glorious international career ahead of him. The German, however, would never appear in the finals of a major international tournament again. By 24, he had retired from international football. Schuster returned to Köln for the beginning of the 1980-81 season, but the cracks had started to show. A bust-up with Weisweiler’s successor Karl-Heinz Heddergott had culminated with Schuster branding Heddergott an amateur. Köln decided to cash-in on their temperamental but talented superstar in the making, breaking up the talented attacking triumvirate of Schuster, Pierre Littbarski and Tony Woodcock in the process. Schuster’s departure from Köln had a knock-on effect at international level. With the very real possibility of a move to the New York Cosmos being discussed, Shuster’s national coach Derwall refused to consider him for selection as long as a move to the NASL remained more than just an idle threat. Franz Beckenbauer was highly vocal in trying to dissuade Schuster from making the move to New York and in the end, Schuster signed for Barcelona. With the move to Catalonia came a return to Derwall’s squad for the upcoming World Cup qualifiers, yet Schuster would again find himself temporarily excluded after an incident where he refused to go to a party thrown by a fellow international, allegedly due to Schuster simply not liking him. Derwall, wanting to foster increased squad spirit, reportedly took exception to Schuster opting out and phoned him directly from the party voice his displeasure. If Schuster expected to find higher degrees of harmony at the Camp Nou then he was to be disappointed. Barcelona legend László Kubala was the man in charge when Schuster arrived at the club and he made no secret of the fact that he didn’t want the player. Kubala had been replaced by Helenio Herrera before the turn of the year and Barcelona clicked in spectacular fashion, forcing their way into the title race and reaching the Copa del Rey final. Having climbed to within two points of La Liga leaders Atlético Madrid and just beaten Hércules 6-0, the wheels fell off in dramatic fashion when Barcelona’s star striker Quini was kidnapped. Although eventually freed unharmed three weeks later, Barcelona hadn’t responded well in Quini’s absence, picking up just one point in six games and dropping out of the title race. A tumultuous season would end with a silver-lining, however, as Barcelona lifted the Copa del Rey by beating Sporting Gijón at the Vicente Calderón, Quini scoring twice in a 3-1 win against his former club. By the time the 1981-82 season kicked off Schuster was playing under his third different coach in less than a year, as his compatriot Udo Lattek took over at the Blaugrana. The season would end with another capitulation in the title race, although Barcelona would redeem themselves by winning the European Cup Winners’ Cup. Standard Liège were beaten 2-1 in the final at the Camp Nou thanks to a virtuoso performance from Allan Simonsen and a winning goal scored by Quini. This all unfolded without Schuster, who missed the game having suffered a serious knee injury at the hands of a wild challenge from Athletic Club’s Andoni Goikoetxea –The Butcher of Bilbao – earlier in the season. The knee injury sustained from Goikoetxea also cost Schuster the chance to play in the 1982 World Cup. Schuster’s international career was unwittingly on borrowed time, with an increasing number of disagreements with some high-profile names only serving to alienate him further. When he refused to travel to Albania with the national team for a game in 1984, instead electing to be present at the birth of his child, the fallout and recriminations drove him to announce his retirement from international football. In his absence, West Germany uncharacteristically crashed out of Euro 84 at the group stages. 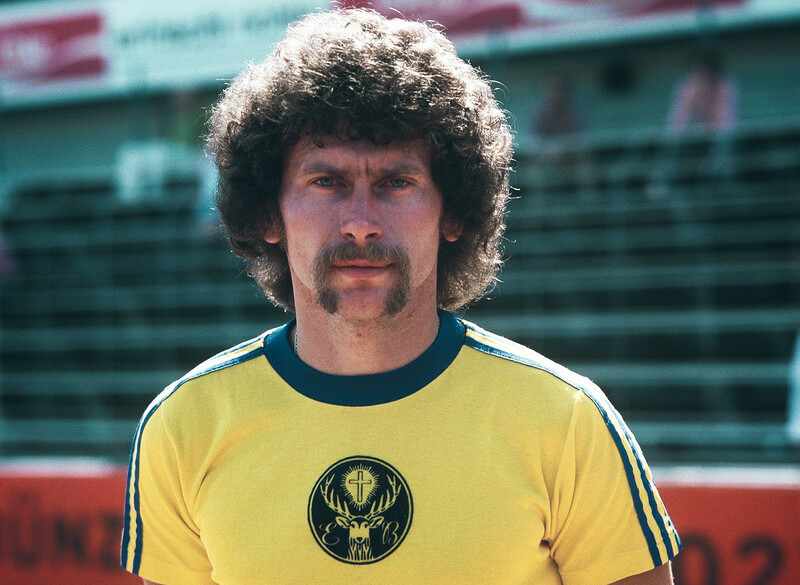 Derwall paid with his job and despite Franz Beckenbauer succeeding him, even the most legendary of German footballers couldn’t persuade Schuster to reverse his decision to retire from the international game. Back in Catalonia, Schuster recovered from his injury and found himself with a new teammate for the 1982-83 season. In a transfer that momentarily stopped the world in its tracks, Diego Maradona was signed from Boca Juniors. It seemed a marriage made in heaven, yet Barcelona being Barcelona it didn’t quite work out that way. On the day Maradona was unveiled publicly in a Barcelona shirt at an open training session at the Camp Nou – witnessed by over 50,000 supporters – it was Schuster’s name that reverberated from the stands rather than Maradona’s. In Maradona’s two seasons at Barcelona, he linked almost telepathically with Schuster, but it wasn’t enough to bring the avalanche of trophies that the transfer had been expected to. Long before the 1982-83 season had drawn to an end, Lattek was gone. César Luis Menotti was brought in and 1983-84 was eagerly anticipated. Andoni Goikoetxea struck a major blow once more, however. This time he administered a serious injury to Maradona. Barcelona finished a point behind Athletic in the title race and faced them in a vicious Copa del Rey final at the Bernabéu that ended in a 1-0 win for Athletic, but also ended with one of the most violent on-pitch fights the game has ever seen. In near riot conditions, Maradona exacted his own justice from Goikoetxea and his teammates with flying kicks and wild punches being meted out. 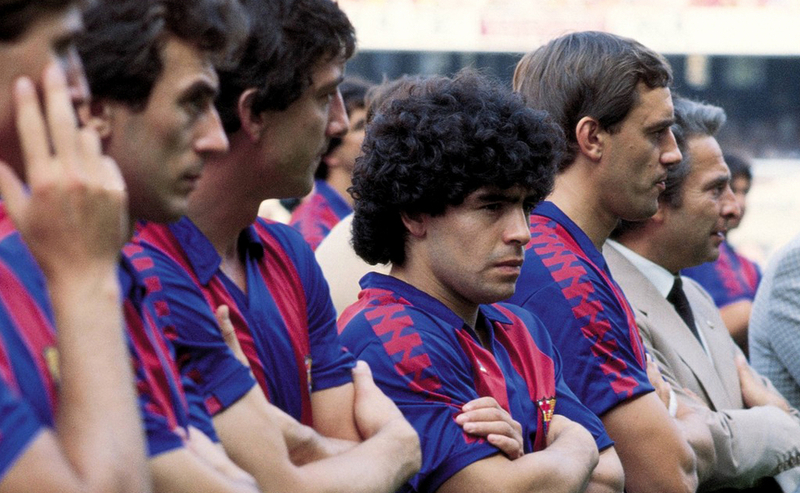 Neither Maradona nor Menotti was with Barcelona by the time the 1984-85 season began. They were replaced by Steve Archibald and Terry Venables. What came next was far from expected as without the best player on the planet and a World Cup-winning coach, but instead with a former QPR manager and a player who kicked his first professional ball in anger with East Sterling, Barcelona ran away with the La Liga title. Schuster was the on-pitch architect of the success as Barcelona clinched their first La Liga title in 11 years and only their second since 1960. Schuster had got along with Venables far better than he ever envisaged, at least at the beginning. A rift soon appeared that was widened by the regular visits of Schuster’s forceful wife Gabi, sometimes barging her way through the dressing room to confront Venables. Vague amusement eventually gave way to irritation. Venables considered a Barcelona future without Schuster, but Schuster was the fans’ idol. By 1985, Venables and Schuster struggled along with each other. Disappointment came as their hard-fought for La Liga title was taken from them by bitter rivals Real Madrid, their first title win for six years. Barcelona had a bigger prize in sight, however. In 1986 they were still a club awaiting its first European Cup success. They’d lost the 1961 final to Benfica and fell at the semi-finals in 1975 to Leeds United. For a club that often proclaimed it was the biggest in the world, it was a glaring omission from their honours list. In 1986, Barcelona were on target to change all of that, having reached the final in Seville after mounting a tremendous second leg comeback, from a 3-0 first leg deficit in the semi-final against IFK Göteborg. All that stood in Barcelona’s way to their ultimate glory was Romanian champions Steaua Bucharest. The stuff of Catalan dreams soon turned into their worst nightmare. In one of the poorest European Cup finals to ever take place, the game drifted through 120 minutes of frustration for Barcelona; the biggest talking point being the withdrawal of Schuster with just five minutes of normal time left to play. Schuster, in a blind rage, stormed out of the stadium and went back to the team hotel. As extra-time failed to come up with a winning goal and with Barcelona in need of the sort of inspiration Schuster could deliver, the game went to a penalty shoot-out. Barcelona missed all four penalties. The European Cup was lost once again. The coach, Venables, and the president, Núñez, had questions to answer, but they also had a handily placed diversion to take unwanted attention away. Schuster walking away from the ground in Seville was massive news. Núñez made hay, branding Schuster’s behaviour unacceptable and demanding Venables never select him for the Barcelona side ever again. Enquiries from other clubs to sign Schuster were waved away by the president. Schuster, at 26, was ostracised. Entering his peak years, he would lose the entirety of the 1986-87 season despite being fit for purpose. In Schuster’s absence, Barcelona lost out on the title by just one point. He might well have made the difference had he been allowed to play. After a poor start to the following season, Venables had gone. Núñez, beginning to feel the wrath of the supporters, appointed Luis Aragonés and called for the return of Schuster. Aragonés even handed Schuster the captain’s armband on some occasions. With league form poor and civil unrest between players and the president, Aragonés did well to lead Barcelona to Copa del Rey success amidst the chaos that surrounded him. In the summer of 1988, before handing the manager’s job to Johan Cruyff, Núñez culled the Barcelona squad of the majority of its “mutinous” members, of which Schuster was deemed one. The supporters mourned his loss as a player. Any good will soon dissipated, though, as Schuster turned down offers of a return to West Germany and potential moves to Serie A, instead opting to stay in Spain, where his young family was settled. Schuster was unveiled at the Bernabéu to much rancour in Catalonia. Running the gauntlet of hate on his return to the Camp Nou was his only domestic hindrance on the way to winning his second La Liga title as part of a league and cup double under the leadership of Leo Beenhakker. So often forced into the role of the talismanic figure at Barcelona, Schuster embraced being a component part of a near perfect team unit with Real Madrid – ironically, the very thing he could have had at international level with West Germany. In 1989, Real Madrid also reached the semi-finals of the European Cup where they were comprehensively taken apart by Arrigo Sacchi’s AC Milan. Schuster was a La Liga winner again in 1990, with Leo Beenhakker having been replaced by John Toshack, who deployed Schuster in a deeper-lying role than the previous season. The title was won convincingly, but Real Madrid once again failed to conquer Europe. This was Real’s fifth successive La Liga title and within that span of time they’d reached the semi-finals of the European Cup three times. With almost a quarter of a century having passed since they’d last won the tournament it had reached a Holy Grail footing. Los Blancos were repositioned somewhat in the summer of 1990, and with a limit on the number of foreign players permitted to take to the field Schuster was squeezed out of the equation. With a year remaining on his contract and despite two seasons of near faultless football he was paid up on the final year of his contract and told he was free to negotiate with other clubs. Real Madrid’s desire to conquer Europe saw them take their eye off defending their position at the top of the tree domestically. Cruyff’s Dream Team at Barcelona soon wrestled the crown away from the capital. As the 1990-91 season began, Schuster was still without a club. Again, his favoured option was to remain in Spain and eventually he took up an offer from the larger-than-life Jesús Gil at Atlético Madrid. The move was typical Schuster, having been spurned by Real Madrid he popped up at their cross-city rivals. Questions were raised whether the teaming up of Gil and Schuster was some kind of publicity stunt, given both individuals’ temperamental personalities. With Atlético having struggled prior to Schuster’s arrival, however, it became the catalyst for vast improvement. With Schuster teaming up with Paulo Futre and Manolo to devastating effect, Atlético launched an unlikely title challenge. They also won back-to-back Copa del Rey’s in 1991 and 1992, the ‘92 success coming at the Bernabéu against Real Madrid. Schuster opened the scoring with a spectacular free-kick. 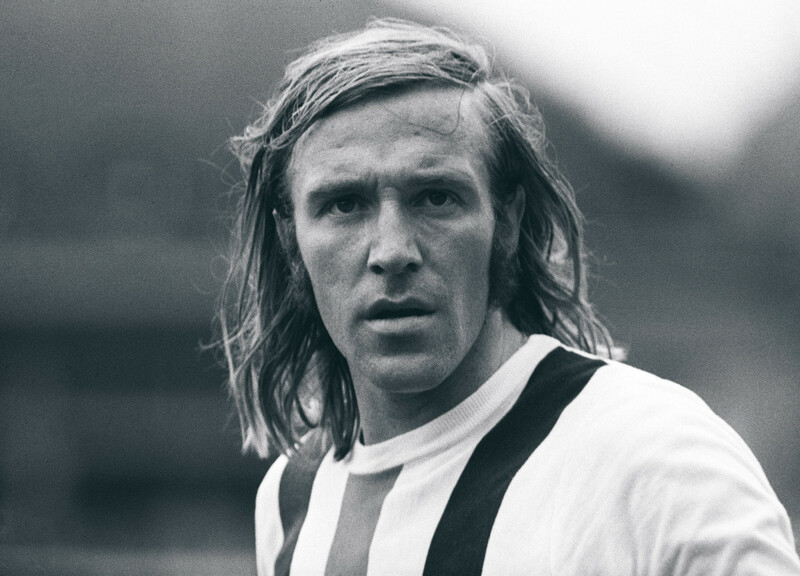 The German played some of the best football of his career in the red and white stripes of Atleti. Playing again under Aragonés seemed to work wonders for Schuster. His relationship with Gil inevitably soured in 1993. Injury problems kept him out of action for extended periods and Los Colchoneros didn’t function as well without Schuster’s presence. Gil resented Atleti dropping out of contention and he even accused Schuster of not doing enough to return to fitness. His time in Spain was coming to an end after thirteen remarkable years. In the summer of 1993 Schuster finally accepted one of the many overtures he’d received to return to the Bundesliga and signed for Bayer Leverkusen. Again, he was in imperious form and once more there were calls for him to return to the national team, this time for a unified Germany at the 1994 World Cup. Again, a World Cup took place without his participation. Further honours eluded Schuster at Leverkusen and by 1996 he had again exited a football club under a perceived cloud. He played out the final games of his career in Mexico, still insistent he could do a better job than anyone else. Schuster would eventually return to Spain as a coach, taking in spells at Levante, Getafe, back at Real Madrid where he again won the La Liga title, and most recently at Málaga. His coaching career has been far more nomadic than his playing career, taking in many countries, but it has been no less volcanic at times and controversy has continued to shadow him. Just how Schuster the coach would have dealt with Schuster the player is something we’ll never know, but Schuster the player is one that deserves to be mentioned in the same breath as any of the great players of his generation. The lack of an iconic image of him at a World Cup keeps him out of mind for many people, but the name of Bernd Schuster belongs alongside the very best.